Tayloria mosses belong to the wonderfully named Splachnaceae family, and grow on dung and carcasses! 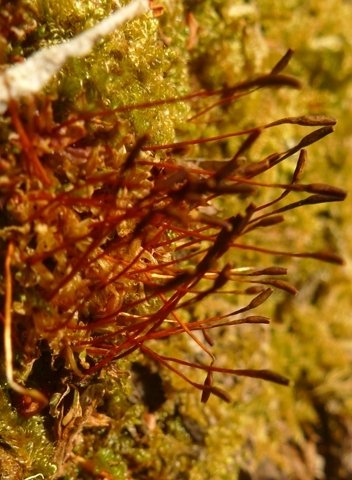 Such substrates are unusual for mosses, and Tayloria has several adaptations for its specialist life-style. Tayloria moss, near Riverton. Photo Leon Perrie, (c) Te Papa. Mosses reproduce by spores, which in most cases are dispersed by the wind, and may or may not land in a suitable place for the spore to germinate. The spores of Tayloria are sticky, so they adhere to flies and other animals attracted to the dung or carrion. Moreover, the capsule producing the spores mimics the foul smell, attracting the visiting flies close to the spores. In this way, Tayloria mosses increase their chances of dispersing from one dung heap (or dead body) to the next. Some overseas Tayloria mosses are so specialised that the odour they emit is chemically tuned to the dung smell of a particular animal. Anne Gaskett from the University of Auckland talking to Radio New Zealand’s Our Changing World programme about her research on Tayloria mosses. New Zealand has three indigenous species of Tayloria mosses; look out for them! Te Papa’s WELT herbarium holds c. 160 specimens. 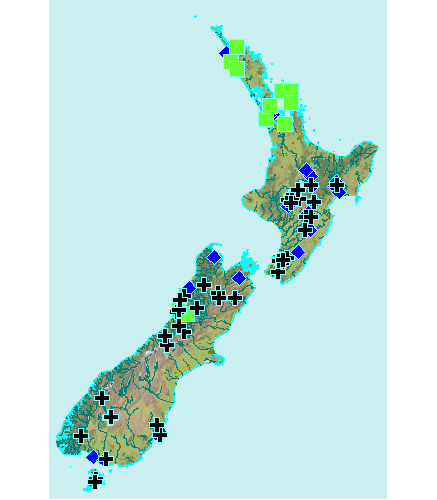 Distribution map of Tayloria specimens held by Te Papa. Thanks Jon. That’s a great find by Colin. I’ll let the bryologists here at Te Papa know as I’m sure they’ll be interested. You might be interested to learn that Colin Meurk just found a fourth Tayloria species for New Zealand, Tayloria tasmanica, in Stewart Island. Alan Fyfe made the identification. Colin’s observation with photo is here on NatureWatch NZ and we have a blog post on the discovery (which links to your nice blog post). Are you aware of anyone else seeing Tayloria tasmanica in New Zealand? Alan Fyfe wasn’t and there are no NZ records on NZ’s Virtual Herbarium. Love the title “poo moss” ha ha ha classic, got my attention when I saw it in the inbox lol. I remember seeing a bbc doco on fungi sporing from cow dung. apparently (dont quote me I’m not 100%) its the fastest known organism on the planet! The type they where studying shot the spore out like cannons and travelled well over the speed of sound! Now I find out that moss can actually mimic odors?? lol crazy, crazy stuff! who would of thought “poo moss” and poo fungi could be so fascinating 🙂 Thanx for the post!